In the U.S., rapid advances in mobile technology and 5G networks are expanding the scope of mobile capabilities. Even those countries without fiber optic networks are leapfrogging technologies by expanding wireless infrastructure. 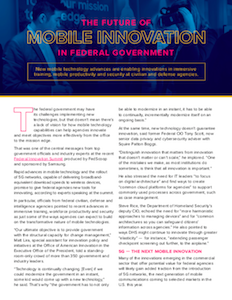 In federal agencies at home and field offices abroad, these developments show promise for innovative ways to use mobile devices in meeting agency objectives. Officials from federal civilian, defense and intelligence agencies pointed to recent advances in immersive training, workforce productivity and security as just some of the ways agencies can expect to build on the transformative nature of mobile technologies. “The government has to not only be able to modernize in an instant, it has to be able to continually, incrementally modernize itself on an ongoing basis,” noted Matt Lira, special assistant for innovation policy and initiatives at the Office of American Innovation in the Executive Office of the President. Lira’s comments, and those from other government and industry experts, are featured in a new report, sponsored by Samsung, highlighting the key takeaways from the recent Federal Innovation Summit. Mobile technology is already transforming how the military thinks about training through its embrace of VR/AR at the U.S. Army Training & Doctrine Command, according to Tony Cerri, TRADOC’s director, data science, models, simulations. Mobile technology can help agencies delivering training experiences to personnel in the field rather than requiring personnel to travel to training centers. Experts suggest leveraging and expanding on existing capabilities from today’s gaming community, which already uses common tools and code to create sophisticated and realistic experiences for the end user. If agencies have been slow to innovate using mobile technology, a contributing factor has been lingering concerns around security. Many agency IT officials worry about cyberattacks involving endpoint devices as a means of accessing agency networks. Yet many agencies aren’t taking advantage of technology they may already have to reduce their risks. Digital transformation in government cannot ignore the need of human capital management and workforce transformation. Recruiting young people into government service, especially those who’ve grown up on mobile technology, is a concern for agencies as they search for ways to incorporate new and emerging technologies into their office tools. Read more about trends and developments in mobile innovation.